On behalf of the Village of Crooksville, I would like to welcome you to our village. As a lifelong resident of our Village, I have found it to be a wonderful faith-based community with a strong workforce. It’s not that we lack challenges, but people here share a common bond and work together to solve problems and advance good causes. We offer a safe environment with quality emergency services. The cost of living here is relatively low, and people come for many reasons, including inexpensive housing, and a relaxed lifestyle. Our Village has a number of recreational assets which include an indoor recreational center, North and South Parks, and an outdoor Olympic size swimming pool. We have numerous rural attractions within minutes of the Village such as the Ohio Pottery Museum, Perry State Forest, Wayne National Forest, Burr Oak and Dillon State Parks, which offer camping, hiking, hunting, fishing, boating, and ATV activities. Keeping the public informed through social media is the future of community involvement and development. I hope your visit to our website has been informative and we welcome your comments. The last day for kids to do the climbing wall in the Rec Center will be this Thursday (April 11). The Community Development staff at Hocking Athens Perry Community Action (HAPCAP) is working with the Perry County Commissioners and the Village of Crooksville to secure a competitive grant through the Ohio Development Services Agency. If funded, this grant can be used to perform a wide variety of community improvement projects. Examples of eligible projects include park improvements, playground equipment, sidewalk improvements, ADA curb ramps, street repairs, storm drainage upgrades, fire protection and demolition of unsafe buildings. It is important that residents attend the community meetings to suggest and prioritize the improvements that are most needed in the community. For more information, please click on the following link: Village of Crooksville Neighborhood Revitalization Grant Community Meeting. 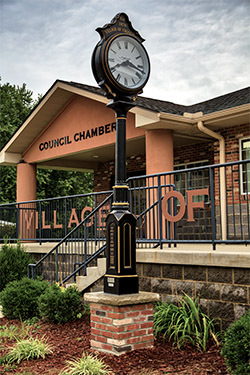 In July, the Village installed a new community clock in the landscaped area in front of the Village Administration Building at 98 South Buckeye Street. It is intended for the clock to serve as a focal point for the community. It’s nostalgic, a potential source of community pride, and a throw-back to when people lived in smaller towns and a clock was the anchor of the community. The clock was crafted by The Verdin Company, located in Cincinnati. In 2017, Verdin celebrated its 175th anniversary as a family business. Verdin has over 55,000 installations worldwide and is the oldest privately-held manufacturing business in Ohio. Please stop by and take a look at this new beautiful addition to our community. For more information about our Village Clock, please follow this link. This project will be financed partly by a below-market interest rate loan from the Ohio Water Supply Revolving Loan Account (WSRLA). The Ohio EPA will make available for public review an environmental report of the project. Upon its release, the document will be viewable at the Village Administration Building (98 S Buckeye Street Crooksville, Ohio 43731), on this website, and the Ohio EPA’s website (“Documents Available for Review and Comment” – WSRLA Documents for Review and Comment”). If you would like to receive either an electronic copy via e-mail or a paper copy of the document via U.S. mail upon its release, please email Dan Halterman of Ohio EPA or call (614) 644-3658. E.M. Viquesney sculpted this life-size pressed-copper statue of a WWI doughboy advancing through “No Man’s Land”, carrying a grenade and a rifle. The statue honors those who served in World War I. Beneath is a brick pedestal with a plaque dedicated to the veterans of the Civil War (1861), the Spanish-American War (1898) and World War I (1917). The statue is located next to the Village Administration building at 98 South Buckeye Street. The Village of Crooksville, Ohio is an Equal Opportunity Employer, USDA is an equal opportunity provider, employer, and lender. El Departamento de Agricultura de Estados Unidos (USDA) es un proveedor, empleador y prestador que ofrece igualdad de oportunidades. © 2019 - Village of Crooksville, Ohio. Site developed by Dynamic Digital Solutions, a web design company in Logan, Ohio.